According to Reuters, North Korean leader Kim Jong-un, during "in-depth discussions" with his South Korean counterpart Moon Jae-in, agreed to hold top-level talks between the two countries on June 1. On Saturday, Seoul's presidential office said that earlier in the day Moon and Kim had met for the second time in the village of Panmunjom in the demilitarized zone. "[President Moon] arrived to discuss an important issue. We held an open conversation… We want to make all the efforts to achieve results [in the negotiating process]," Kim was quoted as saying by the Yonhap news agency. The next meeting will be held on Friday, the Yonhap news agency reported citing North Korea's Korean Central News Agency (KCNA). Moreover, the leaders agreed to meet frequently in the future to make bilateral dialogue "brisk" as well as expressed their commitment to efforts aimed at the denuclearization of the Korean Peninsula. During the Saturday meeting, Kim also reportedly expressed a "fixed will" to hold a North Korea-US summit on June 12. Kim also expressed his will to improve the North Korea-US relations and establish a mechanism for permanent and durable peace. In turn, South Korean President Moon Jae-in expressed a hope that the North Korean-US summit would eventually take place. "The expectations for the North Korea-US summit are high as never before … I believe that our today meeting is very important as it demonstrates that we are working on the very important meeting together,” Moon was quoted as saying by the Yonhap news agency. Moreover, North Korean leader reaffirmed his commitment to full denuclearization of the Korean Peninsula during the talks with South Korean President. “Kim Jong-un has once again reaffirmed his commitment to full denuclearization of the Korean Peninsula and pointed out his wish to end the history of war and confrontation by holding the North Korea-US summit and [engaging in] the cooperation to [reach] peace and prosperity,” Moon was quoted as saying at a press-conference on Sunday. 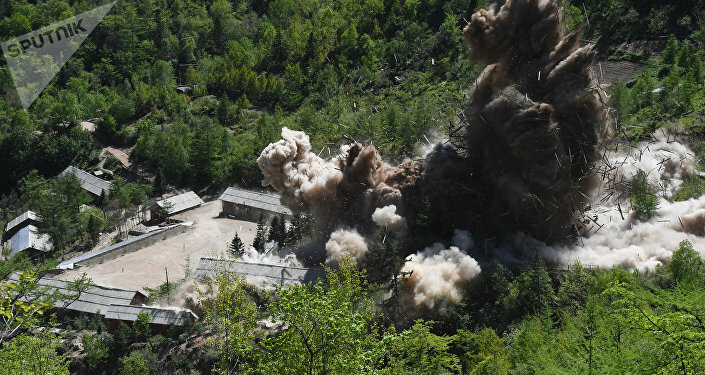 Meanwhile, South Korea regards as "fortunate" the resumption of talks between the United States and North Korea on their leader’s summit in June, a presidential spokesman said Saturday. "It's a fortunate thing that the possibility of the North Korea-US dialogue is still alive without being terminated," President Moon Jae-in's spokesman Kim Eui-kyeom was quoted as saying by Yonhap. He added Seoul was carefully watching the progress of negotiations announced earlier by US President Donald Trump, who said on Twitter the summit could be reinstated or postponed beyond June 12. On Friday, The New York Times newspaper reported that some of Trump’s advisers differed sharply on what the president should get from the meeting with North Korean leader Kim Jong Un, if it eventually takes place. The newspaper also cited a senior White House official, who said that even if the meeting was reinstated, it would be impossible to hold it on June 12, as it had been scheduled before. "Unlike what the Failing and Corrupt New York Times would like people to believe, there is ZERO disagreement within the Trump Administration as to how to deal with North Korea…and if there was, it wouldn’t matter. The @nytimes has called me wrong right from the beginning!" Trump wrote on Twitter. The president also denied the existence of a senior White House official, who had been cited by the newspaper. "The Failing @nytimes quotes ‘a senior White House official,’ who doesn’t exist, as saying ‘even if the meeting were reinstated, holding it on June 12 would be impossible, given the lack of time and the amount of planning needed.’ WRONG AGAIN! Use real people, not phony sources," he added.